WASHINGTON. Nov 6 (AP) The United States will set up a permanent 3-inch bronze marker this winter at its station next door to the South Pole. 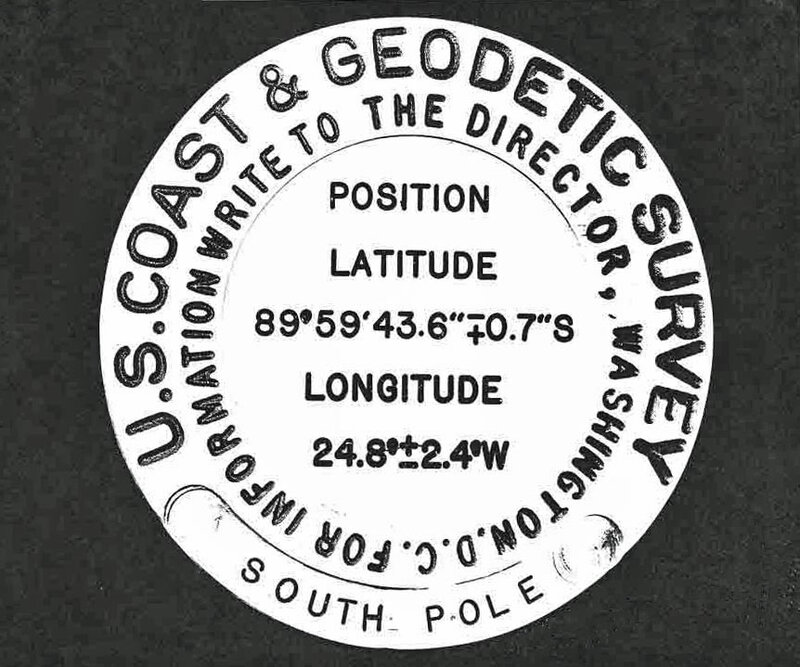 The disc will show that the station is at latitude 89 degrees 59 minutes 6 seconds [sic] south, longitude 24 degrees 8 minutes west, or 1,650 feet north of the South Pole. The United States Coast and Geodetic Survey, which will erect the marker, announced the location today. It was determined from 52 sets of astronomical observations made during the Antarctic's long night by Maj. Palle Mogensen. He was the American scientific leader during the International Geophysical Year. Maj. Mogensen made his observations through a slot in the roof of the station hut. At times the temperature was 100 degrees below zero outside the hut and zero inside the hut. A bit more information...first, note that the Coast and Geodetic Survey, rather than USGS, had technical jurisdiction at this time over this part of the world, hence the main labeling on the marker. 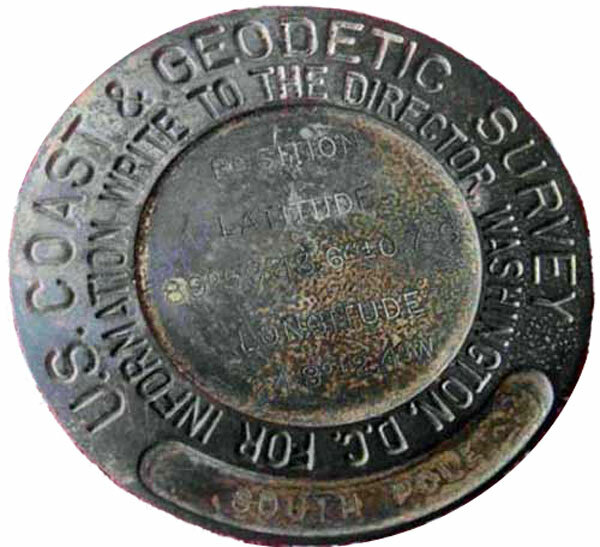 This marker, like many thousands of others used by the Coast and Geodetic Survey and similar/successor agencies over many decades, was manufactured in Washington D.C. by the D. Ballauf Manufacturing Company. And as is obvious from the latitude/longitude, this marker was NOT intended to be placed at the Pole, but rather inside the station. 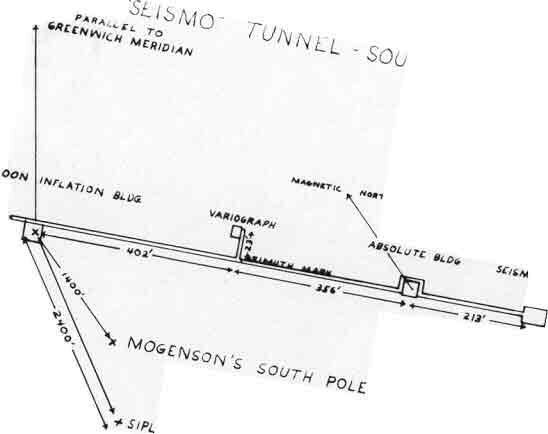 Below is a map cut of the station indicating "Mogensen's Pole" which was what this marker location was based on. I've twisted it a bit to orient it to grid north as we know it these days. Several things must be noted...one being that at this time no one knew that the icecap was moving relative to the Earth's surface, something that would confound the celestial observations used at the time to determine the Pole location. And there was some disagreement as to the location amongst the various observers and calculators. Palle Mogensen was the science leader at Pole in the 1957-58 summer/winter season...otherwise as a US Army major he was involved with various other traverse and helicopter operations during the first 10 years of the US Antarctic Research Program. So where is the marker nowadays? I found no further documentation that it ever was actually placed, or where that might have been. From the map, the marker should have been placed somewhere between the science building and the balloon inflation building...assuming it is there, it is well and permanently buried by now. Credits and documentation (part 1)...basically a lot of thanks are due to 1959 winterover Ed Fremouw, who in 2004 sent me the image of the marker along with the map and the letter below which confirms that the marker was taken to the ice by Henry Francis at the beginning of the 1959-60 season for further transfer to Pole for installation. Ed wintered in 1959 as the aurora observer from the USAF Cambridge Research Center. This appears to have been a replica of the original Pole marker, although a comparison of the fonts and text spacing between this photo and the photo at the top of the page indicates that they were not produced from an identical die. The homeowner had only lived at that location for about a year, and there was no historical indication of why the marker could have been left buried there. 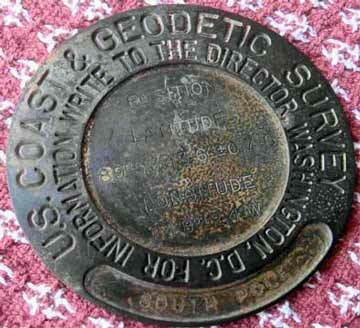 The back of the marker was flat, with no indication of a mounting attachment to a pole or other base as was the norm. I spoke with Dave (retired from NGS) in March 2016, ...he said that they could come up with no explanation of the marker, other than it must have been a replica created at some point. In fact, he indicated that he'd seen a die for that marker at the NGS Training Center in Corbin, VA (south of Fredericksburg). As for the marker itself...the homeowner retained it, and its present location is unknown. ... when a good friend notifies me that this marker was up for sale on Ebay. With a starting bid of $3,450 no less. No it didn't sell. But at the time I contacted the seller and elicited more information from him...which he eventually added to the Ebay sale page. If you'll compare the photo just above to the image at the very top of this page, you'll notice a difference. 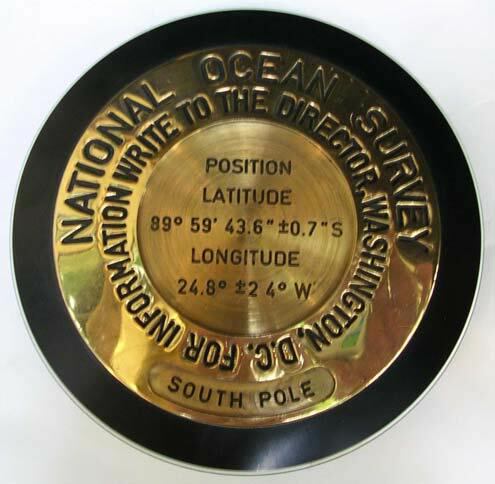 The U.S. Coast and Geodetic Survey was renamed the National Ocean Survey when it became part of NOAA in 1970 (and would later be renamed the National Ocean Service). 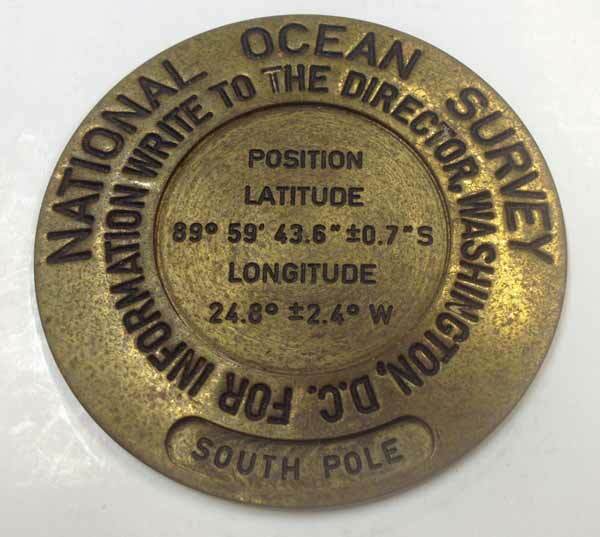 So...apparently some time after 1970, the National Ocean Survey ordered five highly polished versions of this marker as desk ornaments for National Ocean Survey bigwigs. These were mounted on a black base as depicted below. 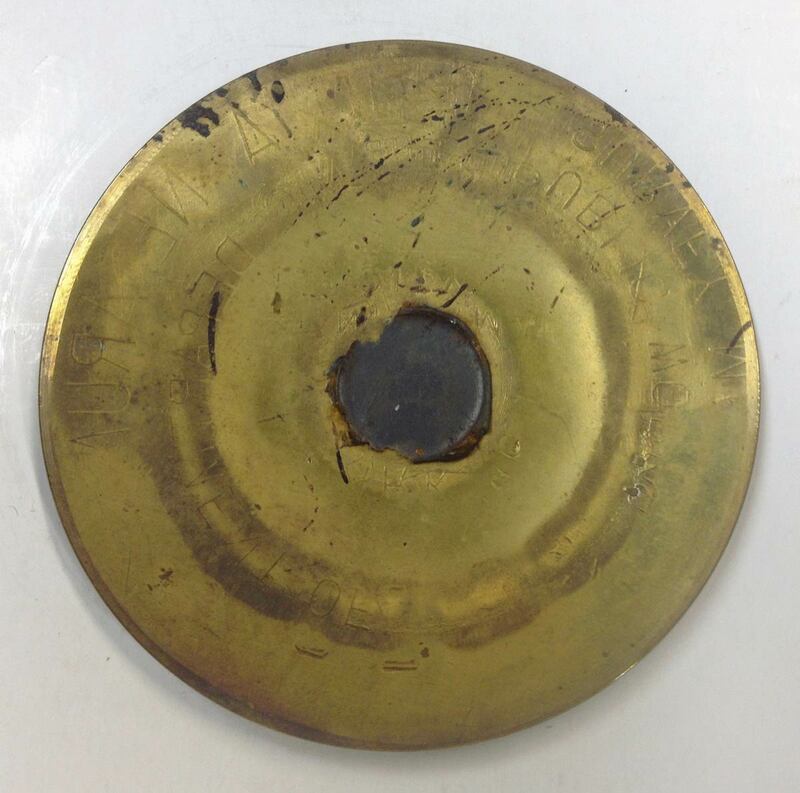 The marker being sold on eBay was made and kept by the manufacturer as a keepsake; it was not highly polished, but had also been glued to a base at one time (photo of the back of the marker being sold). This marker remained in possession of the family that ran Ballauf's until it closed in the 1990's. The seller noted that one of the five polished markers had sold for $5,000 a few years ago. 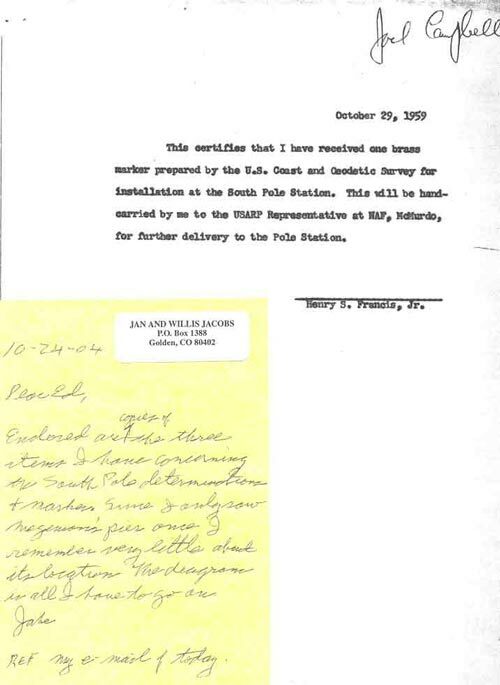 The seller included, on his Ebay sale page, a page from a NOAA historical document which details the history and production of various survey markers. I hunted up the original document which is quite an interesting read. And it contains on page 23 Dave Doyle's small photograph (seen below) of the actual now-lost marker, which I tried to clean up to delete that crocheted background for the photo used above. And the article also prompted me to contact the NGS...and thus I learned its story from Dave. Additional credits--the eBay seller gave me permission to use his images and information on this page.